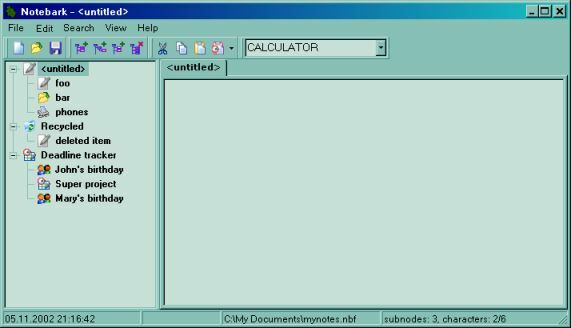 Notebark Lite is free, easy-to-use notepad designed to organize unassorted bits of textual information and place them to an easy accessible place - just single hotkey pressing or mouse click away from you. Notebark has common explorer-like interface. Most of keyboard shortcuts (like file or clipboard operations) are well-known Windows key combinations. Drag-n-drop operations also implemented. The information is organized in a tree outline. You can sort information tree automatically or reorder it manually. Enhanced search functions. You can search text and titles, up and down. Import multiple text files, export to text or HTML With 'autosave on minimize/exit' feature you will never lose your notes. Only pure text. No embedded graphics or rich text formatting except for hyperlinks. You can add links to Web pages, e-mail addresses, files on your local harddisk, FTP sites, and even newsgroups. Ack! I'm getting a broken link. Could someone mirror it, or know of an alternate site? This is probably the best text editor ive seen. I love this thing. This is what the software industry has to realize, getting work done efficiently is the most important thing you do on the computer. This little app is just what i was looking for, and now i got it. Great! GREAT! These latest changes made the program a lot more usable. I hate to be a nag, but NbL could use some context menus. OTOH, if we nag you enough, maybe NbL will turn out EXCELENT. Excellent program that is missing one CRUCIAL thing.. The ability to copy/cut/paste to and from the Windows clipboard. If I copy text from a browser, html editor, email, etc. I cannot paste it into Notebark, or vice verse. This missing function renders this excellent program as impotant. Nice program. Really nice. I used it to organize a bunch of short text files of information that I've gathered on a couple of topics. The only wants that I could possibly have right now are sorting a heirarchy branch, and WORD WRAP in the display window.